This is a 220mm gyuto made of differentially hardened W2 carbon steel, it has been heat treated to 63HRC. The blade height is 47mm at the heel. The handle is made of exhibition grade Hawaiian koa with buffalo horn for the ferrule and end cap and nickel-silver spacers as accents. The saya is also made of koa with a hand turned and knurled nickel-silver pin. Please send me a PM or email, [email protected], if you are interested. 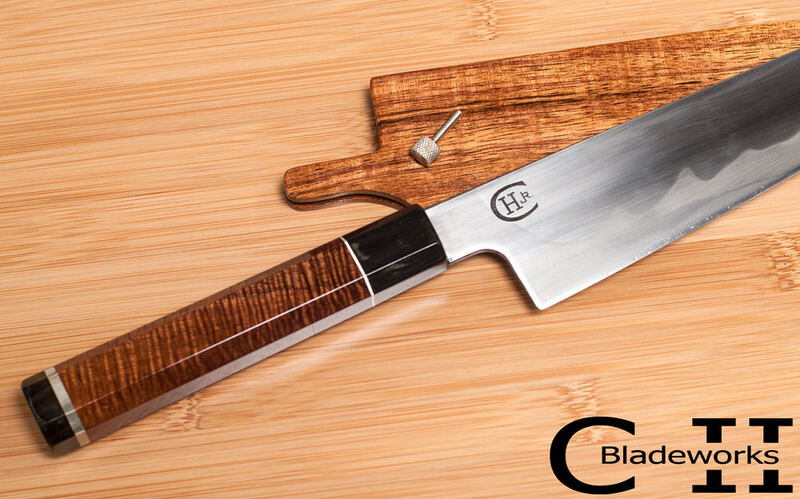 This is a 240mm KS profile gyuto made of 52100 carbon steel at a hardness of 62HRC. The handle is redwood burl with buffalo horn and nickel-silver. 220mm... Perfect, W2 makes it a slam dunk. Nice work. Thanks guys, appreciate the comments. FYI...I fixed the duplicate photo on the 220mm W2 blade. This is a 245mm KS style gyuto made of differentially hardened W2, it has been heat treated to 63HRC. The handle is a fantastic piece of Tasmanian blackwood from Ben Greenberg. The ferrule and end cap are black buffalo horn with nickel-silver spacers. The height at the heel is 46mm and the weight is 7.15oz / 202 grams. This is a 150mm Honesuki made of differentially hardened W2 steel, it has been heat treated to approximately 63HRC. A Honesuki is specially designed to break down poultry and it excels at this task. The handle is Australian Ringed Gidgee with accents of buffalo horn and nickel-silver. The blade is a little lighter in color than what is shown in the photos.While it is a high polish, I did not polish all of the etchant off, it is kind of a gun metal gray look. That W2 differentiated heat treat has for it going on, really nice looking knives! Thanks buddy, I appreciate it.....got $400 of new W2 delivered today....excited! This is a 165mm nakiri made of 52100 carbon steel, it has been heat treated to 62HRC. 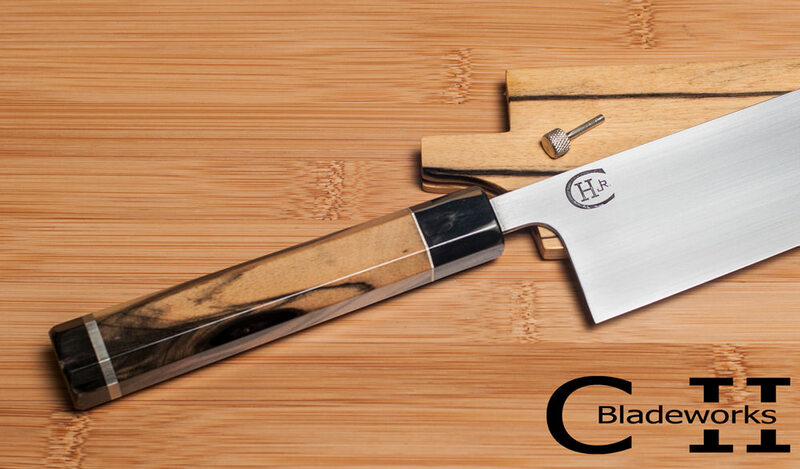 The handle is black & white ebony with accents of black buffalo horn and nickel-silver. The saya is also black & white ebony with a hand turned and knurled nickel-silver pin. This knife is available for $445. Fantastic work - quite stunning! This is a 150mm petty made of differentially hardened W2 carbon steel, it is heat treated to 62-63HRC. The handle is cocobolo with accents of buffalo horn and nickel-silver. The blade is right on 150mm and the height is 30mm at the heel, it weighs 3.5oz. It is available for $365, please PM or email me, if you are interested. The petty above is sold...Thx. Bobby. THE SET BELOW IS NOW SOLD. This is a matched set of W2 blades, a 124mm petty and a 212mm gyuto, the blades are heat treated to 63HRC. 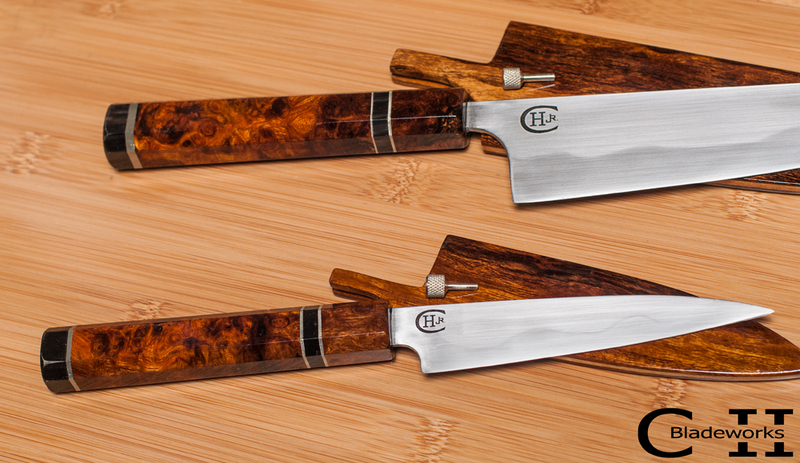 The handles are desert ironwood burl, cut from the same block. The spacers and end caps are buffalo horn and nickel-silver. The sayas are desert ironwood, and again, cut from contiguous pieces. The saya pins are turned and knurled nickel-silver. They are available only as a set for $979. Please PM or email me, if you are interested. The petty weighs 2.90oz and is 17mm tall at the heel. 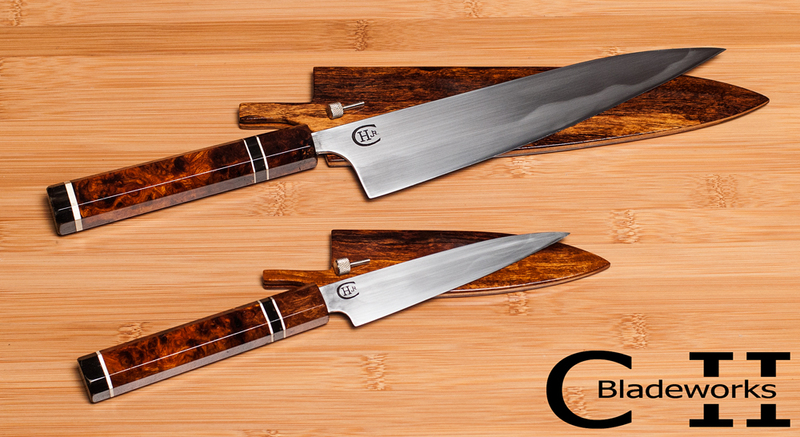 The gyuto weighs 6.25oz and is 48mm tall at the heel.